Here’s the Krispy Kreme offer for the St. Louis Cardinals 2019 season. 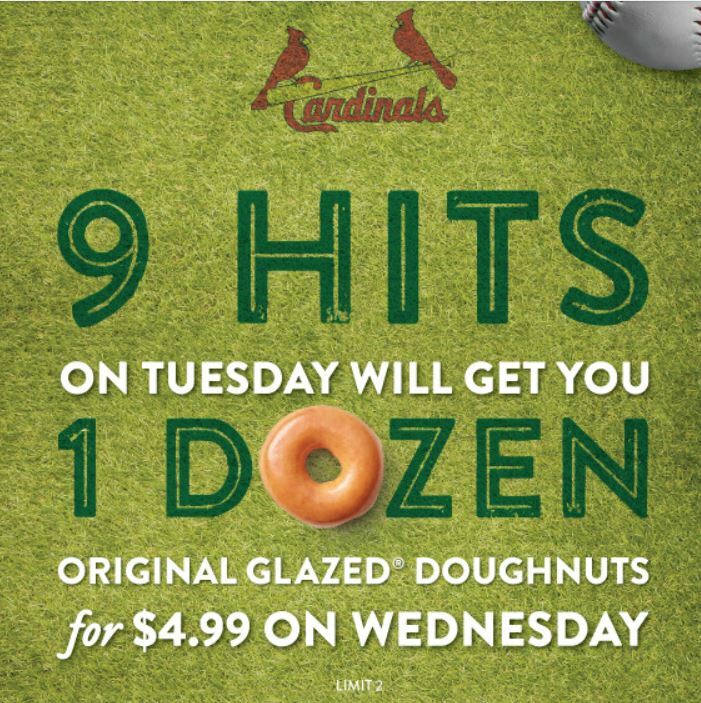 This year when the Cardinals get 9 hits on Tuesday you will get 1 Dozen Original Glazed Doughnuts for $4.99 on Wednesday. There is a limit of 2. Offer valid on Wednesday only if the Cardinals get 9 or more hits on the previous Tuesday. Offer valid only at Cottleville, Ferguson, South County and Fenton, MO and Fairview Heights, Springfield and Bloomington, IL Krispy Kreme shops and is subject to product availability (which may vary by market). Not valid in Puerto Rico. Not valid with any other offer or coupon. Not valid for delivery or online ordering. Void if altered, copied, sold, purchased, transferred, exchanged, taxed, restricted or prohibited by law. Not redeemable at grocery or convenience stores. Customer pays any sales tax. ©2019 Krispy Kreme Doughnut Corp.